Hamilton passed team-mate Valtteri Bottas, who started from pole position, off the line and controlled Formula 1's 1,000th race from there. Ferrari's Sebastian Vettel took third after the team ordered team-mate Charles Leclerc to let him by in the opening laps. And Ferrari's young driver – in his third race for the team – questioned the decision over the team radio, saying: "But I'm pulling away." Ferrari was running third and fourth in the opening laps, with Leclerc ahead of Vettel after passing his team-mate at the first corner, when they made the call to switch drivers. Letting Vettel by cost Leclerc time and ensured Verstappen was closer to him. 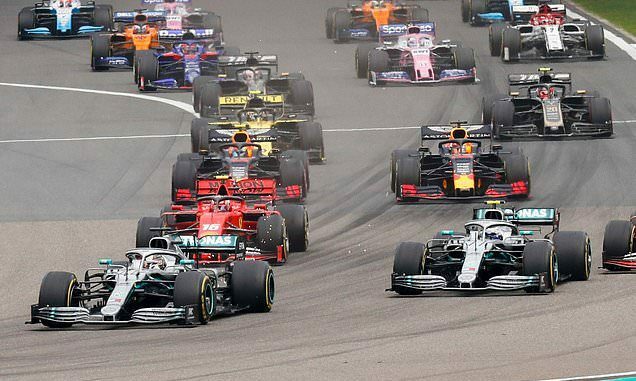 Vettel was unable to pull away – Leclerc sat just as close to his team leader as the German had to him. And he summed up the situation over the radio by saying: "Now what?" With Verstappen just two seconds back, Red Bull triggered the pit-stop period. Vettel kept third – just – and now Ferrari thought about running Leclerc long to give him a tire advantage later in the race. Again, Ferrari had to respond with Vettel – and Mercedes then also did to secure Hamilton and Bottas' positions – and again Leclerc was the loser. Red Bull's Pierre Gasly took sixth, in a race of his own – too slow to keep up with his team-mate but too fast for everyone else. Renault's Daniel Ricciardo was seventh, ahead of Racing Points Sergio Perez and Alfa Romeo's Kimi Raikkonen.